Although Skatter Tech reviewed Microsoft’s LifeCam HD-5000 & HD-6000 earlier this year, the company also offers a more-powerful LifeCam Cinema. While this flagship webcam has been on the market for quite sometime, it still offers a handful of advantages over newer LifeCam offerings. With 720p video, a 5 megapixel sensor, built-in microphone, and auto-focus, the Cinema HD has an upper hand over just about any integrated laptop webcam. Microsoft hits all the high notes with a great product and an affordable price tag making reading this review worthwhile for any heavy video chat users. Unlike the glossy plastic design featured on the LifeCam HD-5000 and HD-6000, the Cinema sports a cylindrically shaped aluminum body with a dark gray matte finish. The camera rests on a flexible rubber-enclosed stand which allows for 360 degree panning and some tilting. The stand can support the unit when resting on a flat surface or affixed on a monitor. A blue LED on the front below the lens indicates activity and a microphone on top enclosed in a metal grille captures audio. A dedicated button, also on top, initiates Windows Live Messenger for placing video calls. The USB 2.0 cable extends out of the back of cylindrical body, is reasonably lengthy, and even comes with a cable management clip. Although images of the LifeCam Cinema HD from Microsoft’s website led me to believe a large body, the camera is rather tiny. It stands just two inches tall and is less than an inch wide. After handling both the newer LifeCam models and the Cinema, it’s clear that the latter is more durable. This camera isn’t as vulnerable to scratches as its glossy plastic counterparts and has a subtle clean design. Unless the Cinema goes through excessive physical handling, it should withstand years and years of use. On that note, while Microsoft doesn’t advertise this camera for travelers, it would have been nice to see a soft case thrown into the package. I still remember the days when installing a new Logitech webcam took about a half hour and often required a system reboot. While that situation probably isn’t applicable to Logitech products anymore, the configuration process for Microsoft’s LifeCam couldn’t be easier. On my dual-core Dell XPS M1530 running Windows 7 Professional, setup was easy as plugging in the webcam into my laptop’s USB port. Within a minute or so, my computer found and installed the necessary drivers. Windows Update even immediately prompted me to download additional software for extra features. Microsoft recommends a system configuration with an Intel Dual-Core 3.0 GHz or higher and 2GB of RAM. My test system has 4GB of RAM but only a 2.5 GHz dual-core processor. Despite the lacking, I ran into no noticeable issues when in use. In fact, the minimal requirements are a 1.6 GHz dual-core processor and just 1GB of ram. However, let’s be clear that this eliminates compatibility with older computers and netbooks. As for Mac OS X users, Microsoft’s compatibility page doesn’t mention any support. Just about every laptop I’ve come across over the past few years sports a 1.3 megapixel webcam embedded above the display in the bezel. While the addition of built-in webcams were revolutionary just a few years ago, not much has changed since. 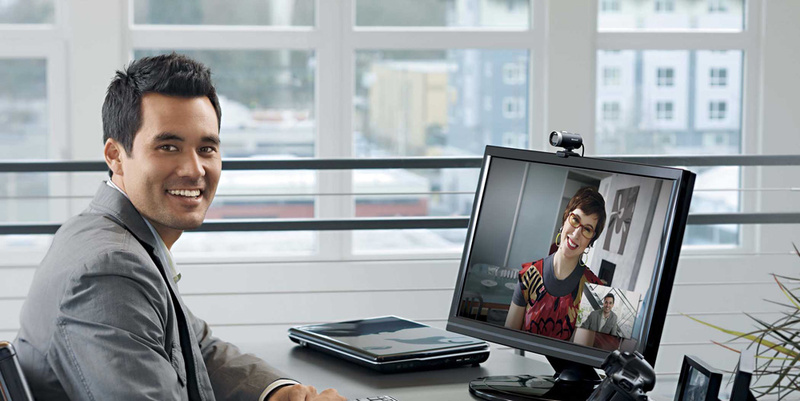 Although convenient for placing video calls on the go, just about all laptop webcams suffer similar issues: fixed-focus, low frame rates, poor colors, and bad quality in low-lighting. Fortunately, the LifeCam Cinema solves just about all those issues. After initiating my first video call, the improvements were clearly noticeable. For one, the LifeCam Cinema sports a wide angle lens, capturing more of your surroundings. And that’s a great addition considering that just about every 2010 laptop display has an aspect ratio of 16:9 display over 4:3. When it comes to poorly-lit areas, ClearFrame technology significantly helps improve image quality. Colors are more naturally represented over other webcams I’ve tested. Videos always remain sharp-looking since the webcam’s auto-focus continuously readjusts on the subject. I also found great frame rates nearing the advertised 30 FPS and lag was fairly minimal. Much like embedded webcams in laptops, internal microphones often also suffer from poor audio quality due to hard drive grumbling and buzzing fans. While some newer laptops now feature dual microphones, dedicated external microphones are generally the best solution. The LifeCam offers a large digital microphone with Noise Canceling technology. After some use, it was clear that the microphone offered a major improvement over the one built into my laptop. People on the other end of the Skype call immediately noted that background sounds were eliminated and that I sounded closer to them. Speech was more articulate and natural as well. However, when I switched over to my AKG Perception 120 USB microphone, they immediately revised their comments in favor of the dedicated solution. 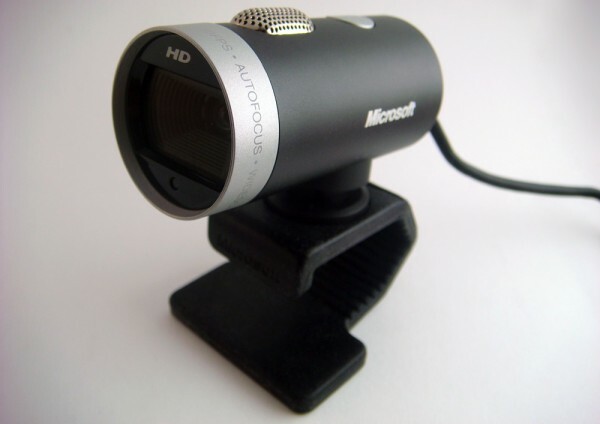 While an expensive standalone microphone is probably unnecessary for day-to-day Skype users, the Cinema webcam’s microphone offers a major upgrade over most internal laptop microphones. While Windows 7 automatically offers drivers for basic audio and video functionality, installing the Microsoft LifeCam application adds a set of extra features. The program offers tools to capture 5 megapixel images and record 720p video. (Audio recording support too.) Custom settings offer microphone volume adjustments, brightness controls, and resolution settings. Gamma levels, color intensity, and flicker reduction are added bonuses. However the real treat comes with a set of fun effects. While I was quick to blow these off at first, when I decided to give them a shot, I was quite surprised. Unlike low quality effects that I’ve seen over the years, these were actually very impressive. While retaining video quality, the effects can tweak the video in a variety of ways. There’s even accessories to wear such as a hat, eye glasses, and much more. The LifeCam’s face tracking was rather impressive, keeping these effects targeted on a person even with movement. While it’s not something that people will use each time they place a video call, it’s nonetheless a fun inclusion that will provide entertainment for some time. I just wish they also had some audio effects as well. If you spend time placing video calls on your computer through services like Skype each day, you should consider upgrading to a quality webcam. However, it’s important to keep a few things in mind. HD video quality is only possible if a few conditions are met. First, both callers need to have a quality high speed internet connection. Just because you have broadband internet, it doesn’t equate to instant HD quality. Second, if the hardware requirements don’t meet the recommended specifications, video quality won’t be great. For those that meet those requirements, the LifeCam Cinema is definitely worth considering. 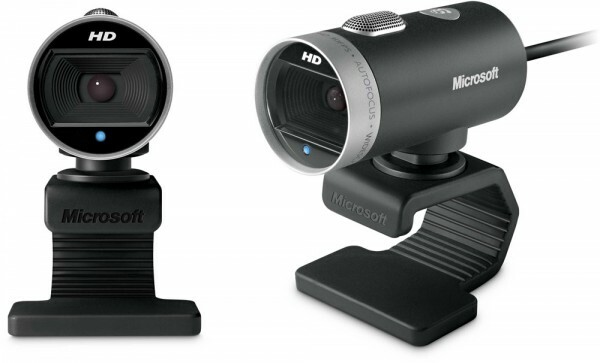 Despite a $80 MSRP, the webcam sells for as little as $50 through retailers such as Amazon.com. For those looking for quality video and a decent microphone, Microsoft’s LifeCam Cinema won’t disappoint. It offers a better image sensor compared to the LifeCam HD-5000 and HD-6000 we reviewed. While it might not capture 1080p video like the Logitech HD Pro Webcam C910, it still has plenty to offer at a reasonable price tag.